Gordon Brown will go down in history as the most incompetent and inept Prime Minister of all time. A man who has brought the once mighty United Kingdom to the brink of bankruptcy. With the country already up to its eyes in debt, Brown’s solution to the economic crisis he created is to borrow even more money in a desperate attempt to bribe voters ahead of next year’s General Election. The only sane voice on the Labour benches is Frank Field. Tony Blair made him Minister for Welfare Reform in 1997 but he resigned a year later after reported clashes with Gordon Brown at the Treasury. Mr Field is a respectable and trustworthy Member of Parliament for whom the term “Honourable” is most apt. But Gordon Brown, the man who thinks he saved the world, is none-the-less prepared to spend hundreds of billions of Pounds of your children’s and grandchildren’s money in a vain attempt to cling on to power. The public should be in no doubt that, despite the huge damage already done to the economy, Brown still has the capacity to make things even worse. We are facing economic oblivion and simply cannot afford another year of this. If Labour MPs have just one ounce of decency left, they will get their snouts out of the public trough and put the interests of the country first. They must ditch Gordon Brown immediately and elect Frank Field as Leader. It won’t save them from an electoral wipeout, but it will at least mean that the brakes can be applied at the Treasury before the damage Brown has caused becomes irreversible. The next Conservative government will have to clear up Labour’s mess, as usual, but having Frank Field at No 10 for the intervening twelve months would certainly help to ensure that we have a less damaging economic policy for Labour’s final year in office. If you truly wanted to save the country, you'd have suggested that the Tories ditch David Cameron & appoint Frank Field as their leader. Then maybe we'd have a national consensus behind a man who everyone knows actually has some credibility. If they appointed Vince Cable as their deputy they'd do even better. 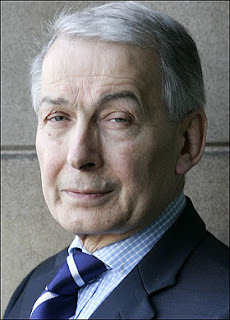 Many political commentators are of the opinion that Frank Field is a Tory MP trapped in Labour clothing. I certainly think he would fit in quite naturally on the Conservative front bench, although I am not suggesting that he walks the floor of the House as that would be disrespectful to the voters of Birkenhead who elected a Labour MP. However, if Mr Field stood as a Conservative, I think he would have a good chance of getting re-elected on the strength of his personal vote, despite his seat supposedly being safe Labour. Philip Hammond MP, who will become Chief Secretary to the Treasury when the Conservatives are returned to power, is proving himself to be hugely capable so I don’t agree that all front benchers are deck chair arrangers! Gordon Brown can be blamed for allowing banks and financial institutions to sel-regulate. However, it was the greedy bankers and financial institutions who did the damage. Barnet Council......put this in as they check all blog, which include 'Barnet Council'. If you get others to do this the council will at least read your comments, even if they ignore them as with most so called 'consultations'.